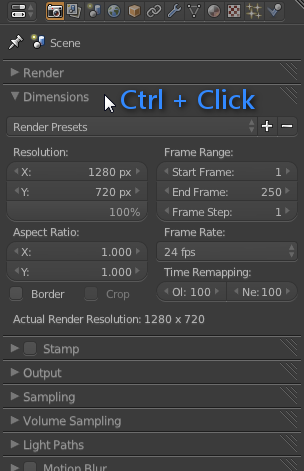 If you Alt-Click on a property, it’ll work on all the selected objects at once, not just the active object. This works on most properties, including modifiers (as long as all the modifiers have the same name, which they do by default). You know that box that pops up every time you start Blender? The one with the pretty picture and a list of your recent blend files? That’s the splash screen. 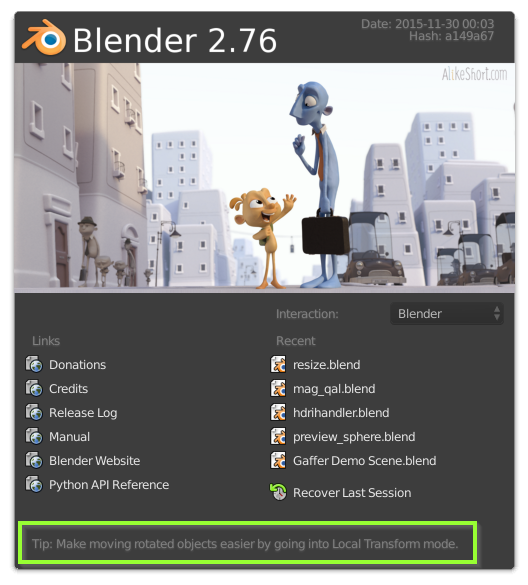 There’s a little add-on hiding in the Testing section that shows a random tip at the bottom of the splash screen every time you start Blender. Campbell added it after a short discussion with the UI team earlier this year. Press F5 over a sidebar or a header to flip it to the other side of the window. 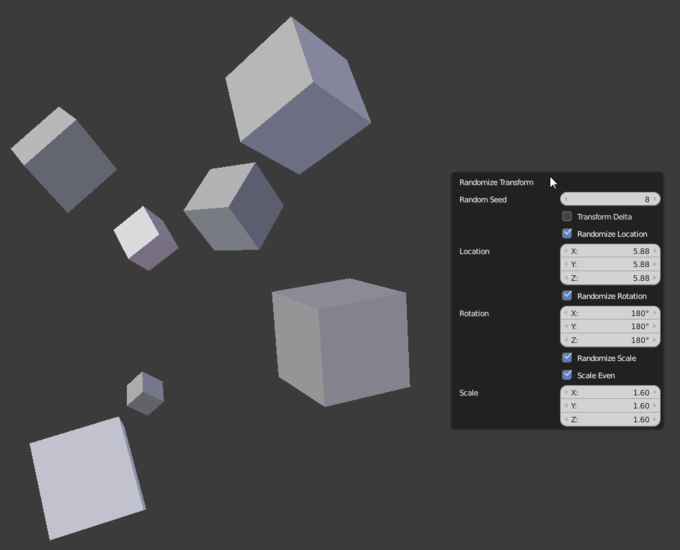 Press E with the mouse cursor over an Object Selection Field to activate an Object Picker. You can make objects appear and disappear by animating their Layer Relation. Edit: Not possible anymore? Shift-Click any folder icon to open that folder within your Operating System. Ctrl-C over tools & menu-items to copy the Python command. Maybe you can think of some more tips we should include in this add-on? Just post them in the comments below and I’ll chat with Campbell sometime :) Here’s a list of the current ones. Ever wanted to randomly position a bunch of objects? Of course you have, and like me, you probably resorted to using Proportional Edit’s random falloff. Such cavemen we are. Or maybe it’s just me. Turns out, there’s a function just for this, and it’s been around for years. What does it do? Yep, you guessed it! 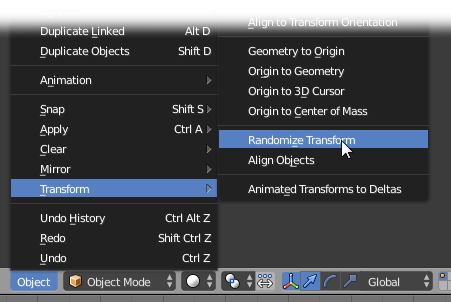 It randomizes the transforms! When you click it, it may seem like it doesn’t do anything. This is simply because the default settings are all on 0, so you just need to press F6 to show all the options. Currently this is mainly useful for picking camera DOF depth. EKey over a distance field prompts you to pick a depth from the camera. WKey (Specials menu) to pick from the 3D view (when the active camera’s selected). Since it was only added yesterday, you’ll need to get a build off builder.blender.org, or follow Gaia’s excellent build-it-yourself guide for windows (which I did the other day, it’s so easy). Or, you know, wait until 2.74 comes out. Hover over the ‘Distance’ property of your camera, press E (just like you normally would to pick colours and values), and then click anywhere in the viewport to select the distance from that point to the camera as the DoF distance. While looking through the camera, open up the Specials menu with W, and choose “DOF Distance (Pick)”, then click in the viewport to pick that point’s distance. I know this has been in blender for eons, but I didn’t realize how nice it was until a few weeks ago. Having so many panels open at one time can get a bit confusing. Personally, I almost always get the Sampling and Light Paths panels mixed up. If you want to collapse all the panels except the one you want to see, simply Ctrl + Click the header of the panel.